This month’s magnificent Star of the Month comes from the collection of JorgeG, a Peruvian lawyer based in Lima. Jorge’s interest in fine vintage watches was sparked by his father, a pilot with the airline Panagra, who had developed an eye for high-quality watches during his many trips overseas. Jorge grew up admiring Rolexes, Omegas, Universals, and other fine Swiss brands of the nineteen-sixties that his father used to bring home to wear or on-sell to his friends, and so it was probably inevitable that Jorge would succumb to the collecting bug. Over the years he has collected many fine steel, gold capped, yellow gold and red gold automatic, electronic and quartz Constellations across most periods and he now focuses on collecting mint examples of several Omega lines including World War 11 steel watches. His journey as a collector reflects that of many Omega aficionados in that a flurry of collecting is followed by a period of rationalisation before settling on a specific collecting stream and only collecting the best – a lesson for us all. My thanks to Jorge for sharing a museum quality example of the Omega Constellation Deluxe model 168.006. You can access a short essay extolling its virtues here, but beware it's a modem burner. I have the same watch. I inherited it from my father. But I remeber that when I was a child I opened it and "fixed it" (I was actually playing with it). As a consequence it really had to be fixed!, with non-original pieces.Like the glass, the crown, the screws that go in the crown, and the leather wrist-band. The incredible thing is that this watch is still up and running. I don't know what it's price is, but I know it deserves a medall for toughness. But, it proves the robustness of these models. Thanks for sharing your story. Mine has: CONSTELLATION and WATERPROOF on the back of the case. The rest seems to be genuine, although I wouldn't have noticed anything without the help of your articles, and I bought it from a "reputable" dealer in London. I think I may have been referring to such things as gouge marks or other marks that are not original, like dedications etc. Your watch correctly has the Constellation and waterproof marks and the sharper these are the better in terms of collectability. Hope that has assuaged any concerns you have. Thanks, That's made me feel a lot better! Hi Desmond, Firstly , thanks for your patience. Does this seem genuine to you? I have been reading a lot of your articles, and i'm still in the dark to the authenticity of my watch! With the K stamp on the case back, it would tell me that the watch was from 1959 but that doesn't seem to match up with the cal.504? I would apreciate anybody's help. Movement serial number Jimmy indicates that the movement was made in late 1958. Case made in 59 - that would seem to gel with me. Calibre 504, the date model of which only 25 thousand pieces were made was made in Switzerland until 1959 (and possibly movements supplied to UK would have been cased up until 1960) when replaced by the calibre 561. So based on the information you have supplied, I would say your watch is genuine. Send me a pic if you have any more queries, but it seems to me youre going the right way about building up knowledge. You can send pic by clicking on the 'about me' icon and then clicking on email. 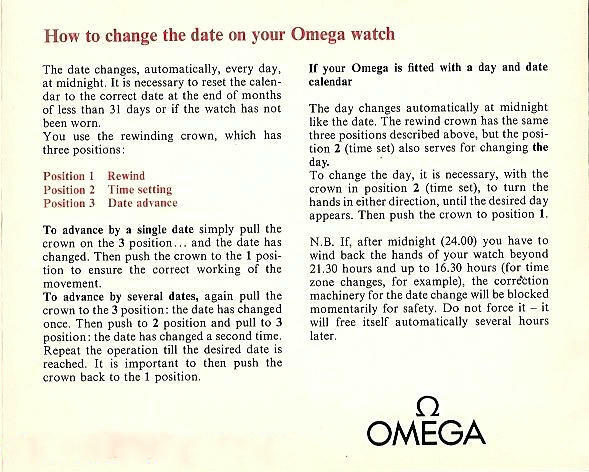 As an Omega Collector, I have read with great interest and admiration your OMEGA topic for a long time. I am now seeking your assistance in assessing my timepiece that I have just received from my friend in Zurich. Specification: Omega Grand Luxe 18k solid gold caliber 354, Ref 14355 SC, pie pan, stepped dial, two lines connecting 6-12 and 3-9 (sorry I do not know how to explain in correct way). I have used the 12x loup to look at the dial and found that it is 100% original dial and like a new one. With your knowledge and experience, please give me your advise. I understand that it is very difficult to find a suitable dial, especially the solid gold, stepped pie pan, arrow head and the cross lines dial. You may post your comment on your website so that our collector fellows can share your knowledge and do not forget to send your advise to my mail box at nakhanh01@yahoo.com. Best idea is to send me some pics. I am Roveno Binaj(from Albania). Hope you remember me! I have the same watch,I would like to sell it.Any one interesed??? Is the same watch that you certificate some months ago! Happy to say Roveno that the watch is genuine. You are telling that my watch is genuine??? Yes, it is a good piece. I wish you all the best things!!!! Ricardo, eu acredito que um 1966 168.005 devem ter a grafia "Chronometer". Talvez o disco foi remodelado em algum momento? quero para ele o balanço com espiral ,mas so achei para ETA 2892-2. Theoretically it should. The movement has a Dubois-Dépraz 2020 chronograph module piggybacked on a fully jeweled ETA 2890-A2, and the balance complete should fit. These are very, very complicated pieces to work on however and many watchmakers avoid taking them on. Hi ! Desmond, okay? hope so . I'm watching this costellation C-Shape and looks all right but I have a doubt with pointers, to me seem to be very thick. I appreciate your opinion. Dial is genuine, movement is correct (a little corrosion on the rotor), case is okay (has lost some of its original finish), and hands are correct. The thin hands are used when the thin markers are used. With thick markers with onysx inserts, the thicker hands are correct. Thanks Desmond. I admire your work in relation to this wonderful house and Omega. Hi ! Desmond, if he had to choose between what I showed him first and this one, which advise me? the two are size 564 as I want but I want the best I can leave my son the day tomorrow. Definitely the first one because the dial is in better condition.